A 13-acre site, in the Judean Lowlands, with hopes for a better future. Well, the cumulative effort of weeks is showing. A water cistern or water system was detected in Omer’s section close to closing time and will be explored more tomorrow, and maybe for days. A riddle was solved: Why were there Byzantine coins in mud bricks of what was apparently an Iron Age structure? The mud brick wall washed down and later material got stuck in it. This can be seen in the section- the clear cut of the excavation square side. So the wall is indeed from the biblical period. A gate in the wall my be visible in Keren’s upper southern section. On the west a series of walls and floor and mud brick walls have been found all over the hillside, and seems to be Iron Age or earlier. On top of the hill more and more finds appear, today including great coins. And in the east, we are opening up more areas as some kind of built system or system are being revealed by painstaking slow work. Future visitors to Azekah will definitely gain from seeing some of these structures dating between 1500 and 3700 years ago and associating them with the historical events and texts. We have new volunteers from Heidelberg and other German universities, England, and elsewhere. CoDirector Prof. Manfred Oeming’s presence has started to be felt. Tomorrow the weekly tour visits Socho who finished their first season today. Well, we attended the first two weeks of the dig, and now that we are back in France, here are our answers… without our French accent and rudeness, but still, with honesty! First we want to thank everyone for their kindness… We even find our supervisors cute! Our favorite times in the day were the breakfast and the beer after dinner and the lecture in the evening (the food was great, we are impressed). Digging itself was fun, when the sun was not too hot! We have mixed feelings about the guest lectures and the mid-week tours: for some of us, it’s too much (the schedule is pretty intense), for others, it’s very interesting to have multiple views on how to excavate, how to do archeological research, how to focus on various aspects of the area, and so on. Our worse moments? Bringing the tools to the digging areas and back, the sporadic WiFi, the warmth during the last hours of the dig… But those are only details, we actually are very thankful to the staff for their incredible work. We already are trying to plan to come next season. We moved out as usual and I was first up on the hill of the volunteers. As they day went on the “oven” got hotter – our Eastern section and Ido’s top section shut down early and we went back to base camp to wash pottery instead. Once again the consideration for the wellbeing of the people is exemplary. But I am happy to report that more walls appeared on the eastern slopes! More buckets of destruction layer material came out from both the top of the hill and the south side, and bits and pieces of the puzzles are coming together. As more squares are opening and the digging deepens, the chances of interpretation increase. 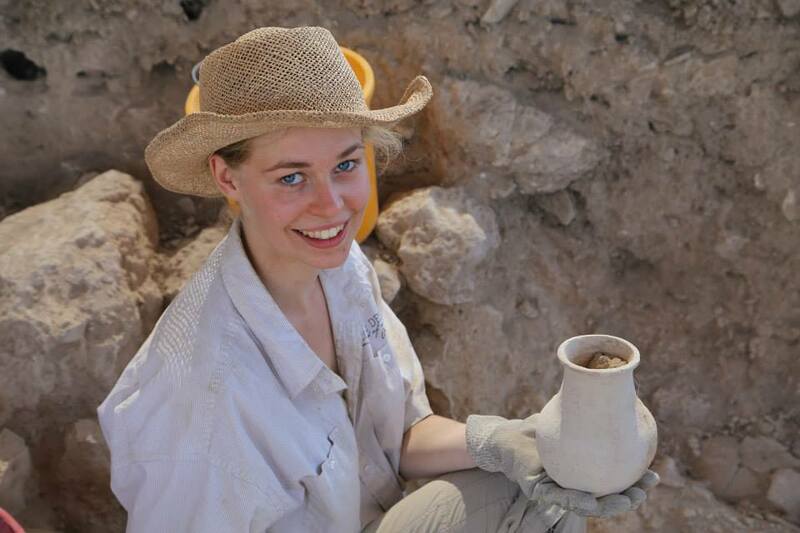 Excitement in the office – 3D modeling is being prepared and when properly mapped the archaeologists can use it to analyze and predict where to dig. It seems the paths up the hill to ancient Azekah may be identified, which can for example indicate where to look for a city gate. More on this later. British rabbis-in-training visited. Curator Leora Freud explained artifacts like a stamped jar handle, a sheqel weight, grinding stones and the like, and why bone and charcoal analysis are important. 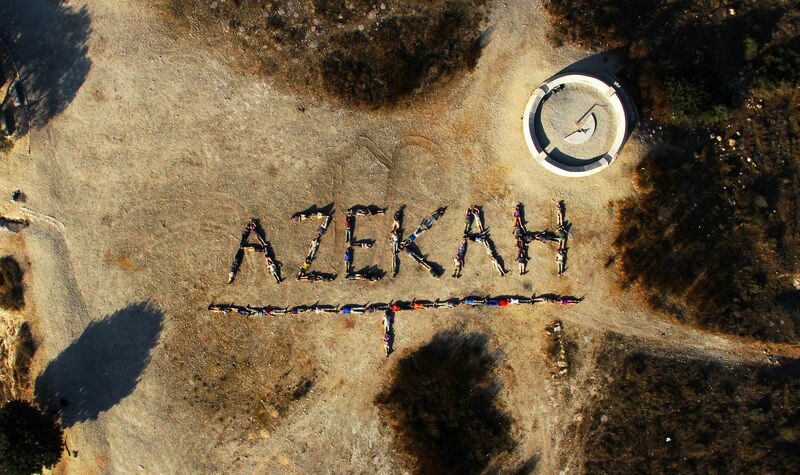 Then we went out to Lachish and Azekah and they “got the picture.” They wanted to “feel the text in their bones” before going out to teach. Dr. Raphael Zarum of the London School of Jewish Studies was there and was most pleased- he is familiar with the Lachish relief from Sennacheriv’s palace in the British Museum, but had never been to Lachish. The group saw walls first uncovered only hours before! The program was organized by Rabbi Mark Daniels. Tarah Van De Wiele’s Azekah Top 10! Thank you for such an amazing experience which I cannot wait to have again!